Is Climate Change Responsible For Arctic Reindeer Decline? 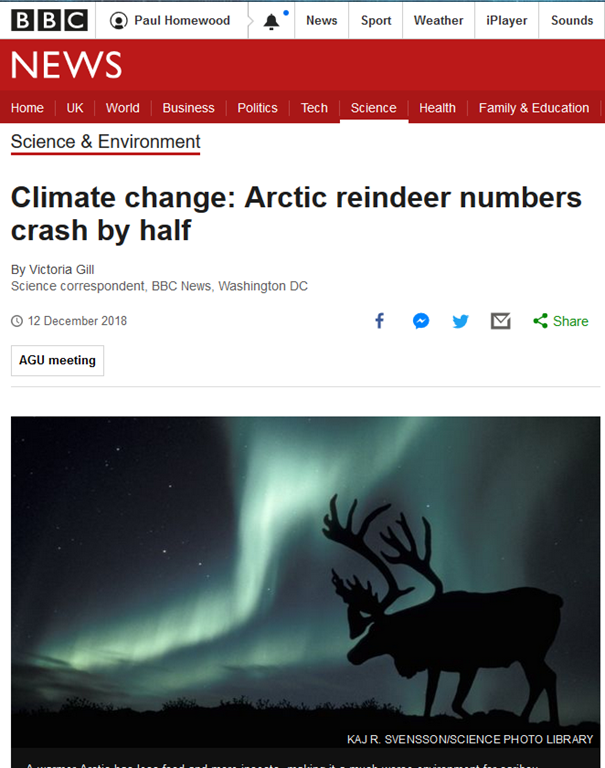 The BBC is happy to uncritically report claims that Arctic reindeer are suffering because of climate change. The population of wild reindeer, or caribou, in the Arctic has crashed by more than half in the last two decades. A new report on the impact of climate change in the Arctic revealed that numbers fell from almost 5 million to around 2.1 million animals. The report was released at the American Geophysical Research Union meeting. It revealed how weather patterns and vegetation changes are making the Arctic tundra a much less hospitable place for reindeer. Reindeer and caribou are the same species, but the vast, wild herds in northern Canada and Alaska are referred to as caribou. It is these herds that are faring the worst, according to scientists monitoring their numbers. Some herds have shrunk by more than 90% – "such drastic declines that recovery isn’t in sight", this Arctic Report Card stated. Why is a warmer Arctic worse for reindeer? Prof Howard Epstein, an environmental scientist from the University of Virginia, who was one of the many scientists involved in the research behind the Arctic Report Card, told BBC News that warming in the region showed no signs of abating. "We see increased drought in some areas due to climate warming, and the warming itself leads to a change of vegetation." The lichen that the caribou like to eat grows at the ground level. "Warming means other, taller vegetation is growing and the lichen are being out-competed," he told BBC News. Another very big issue is the number of insects. "Warmer climates just mean more bugs in the Arctic," said Prof Epstein. "It’s said that a nice day for people is a lousy day for caribou. "If it’s warm and not very windy, the insects are oppressive and these animals spend so much energy either getting the insects off of them or finding places where they can hide from insects." Rain is a major problem, too. Increased rainfall in the Arctic, often falling on snowy ground, leads to hard, frozen icy layers covering the grazing tundra – a layer the animals simply cannot push their noses through in order to reach their food. I am highly suspicious when I hear claims like this. After all, reindeer have been a key component of Eurasian high latitude ecosystems for at least 2 million years, during which the climate in the Arctic has varied enormously. We know that the Arctic has been warmer than now for most of the last ten thousands, most recently during the Middle Ages. So why did not Reindeer all die out then? The Taimyr wild reindeer herd, i.e., caribou (Rangifer tarandus), is one of the most important wildlife resources in the Russian Far North and may constitute the largest migratory Rangifer herd in the world. Over the last 60 years the herd has undergone a recovery from low numbers in the 1940s, reaching high densities by 1970 that concerned wildlife managers and domestic husbandry herds, with an 11.7% annual growth rate. At that time an aggressive commercial harvest of the herd was implemented, and organized wolf control was initiated with the goal of stabilizing herd numbers and injecting needed economic activity into the region. These actions dampened the rate of increase throughout the 1970s and 1980s to a 3.0% annual growth rate. From 1991, after the collapse of the Soviet Union and the loss of financial capability to sustain the commercial harvest and continue wolf control, the population again increased at a 5.6% annual growth rate, until peaking in 2000 at just more than 1 million animals. Since 2000 the herd has been in decline; harvesting, primarily unregulated, has increased; the wolf population has increased; and range conditions have deteriorated. Understanding what has occurred in the Taimyr range can provide North American managers with valuable lessons in understanding the large migratory herds on this continent, especially given that the social and political situation in Russia enabled intensive management, i.e., harvest and wolf control, that may not be able to be duplicated in North America. Note how reindeer population has swung sharply up and down during the last 60 years, ostensibly because of factors such as harvest rates, wolf control and government support policies. Significant efforts began in the early 1970s to actively promote commercial harvest of Taimyr’s wild reindeer in response to concern about overexploitation of the range by a growing wild population (Klokov 1997). This response was made to avoid conflicts with the domestic reindeer industry and to obtain some economic benefits from an expanding wild population (Syroechkovskii 1975). The majority of the harvesting was conducted at river crossings by hunting brigades located along the Piasina and Kheta rivers, at the distance of 15 – 20 km between each brigade (Klokov 1997). As a consequence of the significant commercial investments and returns in the wild reindeer population, monitoring of the herd was much more active than it was in previous decades. Despite a significant increase in harvest throughout the 1970s and 1980s, the herd continued to increase from 330,000 to 670,000 by 1993 (Fig. 2), a 3% annual rate of increase. Harvest peaked in 1988 with 120,000 animals taken (Fig. 3; Kolpaschikov and Mikhailov 2002). As part of sustaining the commercial harvest program, wolf management aimed to dramatically reduce the wolf population within the herd’s range. Not only were wolves killed during harvesting operations and incidental to reindeer herding, but state agencies used an active aerial hunting program to reduce wolf numbers. Even though it was expected that the wolf population would increase in response to increased wild reindeer numbers, the active wolf control program was thought to stabilize and even reduce wolf numbers. On average through the 1970s and 1980s, 500 – 600 wolves out of an estimated population of 1500 wolves (Klein and Kolpashikov 1991) were removed annually within the range of the Taimyr herd. The chain of events that eventually led to the collapse of the Soviet Union had dramatic ramifications for the management and exploitation of the wild Taimyr reindeer herd (Baskin 2005). The state’s financial support for harvest and management of both the wild and domestic populations was eliminated (Kolpaschikov et al. 2003b, Baskin 2005). For the commercial harvesting of the wild population, the change meant that the era of cheap transport, mainly the use of helicopters, was over (Klokov 2004). Whereas population estimates were attempted annually during the commercial period, after 1991 there was no money available for a population count until 2000, when an estimate of more than 1 million wild reindeer was reported (Yakushkin et al. 2001). This constituted an annual increase between 1993 and 2000 of 5.6%. Intensive commercial harvesting stopped abruptly following the dissolution of the Soviet Union, and an era of unsubsidized, unregulated hunting of wild and domestic reindeer ensued. Compared with the commercial harvest in the 1980s, the harvest in Taimyr after 1991 was estimated to have been reduced by 45% – 50% based on the best estimates of researchers in the field (Kolpaschikov et al. 2003b). Private hunting began to increase in 2000. In the period from 2005 to 2010, about 85,000 reindeer were harvested by hunting annually. This number is almost twice the quota set by the state (Fig. 3). Aerial hunting of wolves and the use of specialized on-the-ground wolf hunting squads stopped because of a lack of funding. At the same time, the population of wild reindeer rapidly increased, improving the prey base for the wolves. As a result, the number of wolves and predation rates grew, based on aerial and tracking surveys, to an estimate of 3000-3500 by 2000 (Suvorov 2001a), with predation of up to 50,000 to 60,000 wild reindeer annually. As the wild reindeer population declined, and with wolf numbers still high, managers estimated that by 2009 wolves were responsible for more than 30% of the annual wild reindeer mortality. The Taimyr wild reindeer population constitutes a critical natural resource in central Russia. Over the last six decades managers have reacted to natural and political challenges in the management of the herd. Slow population growth, expansion of range, and conflicts with domestic reindeer characterized the 1950-1970 period. Beginning in 1970, a decision was made to aggressively manage the herd to support local economies, prevent overgrazing, and reduce the conflicts with domestic reindeer. From 1970 to 1990, state agencies actively controlled wolves and supported commercial harvesting through the construction of infrastructure and subsidization of transportation and marketing. With the collapse of the Soviet Union in 1990, agencies lost most of their funding. As a result, commercial harvesting subsidies were halted, wolf control was stopped, and with limited personnel, enforcement was reduced. In the postcommercial period of 1991 to the present, the herd initially increased from the stable condition maintained between 1970 and 1990, peaking at 1 million animals in 2000. Since that peak, the herd has been declining and the experts maintain that wolf predation and unregulated harvest are the major factors in the decline. The experience in managing this large Rangifer herd during its increase and decrease phases offers some lessons for North America, especially with respect to the role of harvest and predation in the regulation of large migratory tundra herds. In short, reindeer population grew strongly between 1970 and 2000, by when it exceeded the carrying capacity of the range. Since then increased hunting and wolf predation have been the major factors in the decline of the reindeer population, back to historical normal levels.